Rife said, "In reality, it is not the bacteria themselves that produce the disease, but the chemical constituents of these micro-organisms enacting upon the unbalanced cell metabolism of the human body that in actuality produce the disease. We also believe if the metabolism of the human body is perfectly balanced or poised, it is susceptible to no disease." Milbank Johnson, M.D conducted the first and only study of the Rife Frequency Generator as a potential cancer treatment. Dr Johnson coordinated the study in conjunction with the Medical Research Committee of the University of Southern California. He treated 16 patients with various types of advanced cancers, all of whom had been declared "terminal" or "incurable". After 3 months of the Rife treatment, 14 of these "hopeless" cases were declared clinically cured and in good health by a staff of 5 M.D.s and by Alvin G Ford, M.D. group pathologist. 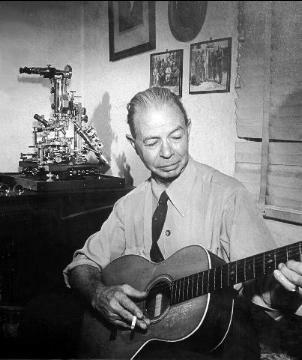 "A number of subsequent clinics in the years 1935-1938 accomplished similar cures....the AMA virtually stopped the Rife treatment in 1939, first by threatening the physicians using Rife's instrument, then by forcing Rife into court....During the period 1935 to early 1939, the leading laboratory for electronic or energy medicine in the USA, in New Jersy, was independently verifying Rife's discoveries...(this) laboratory was "mysteriously" burned to the ground.....Rife's treatment was ruthlessly suppressed by the AMA's Morris Fishbein." ---Barry Lynes. [Barry Lynes.] The Cancer Cure That Worked! William Hung According to Dr. Royal R. Rife, every disease has a frequency. He found that certain frequencies can prevent the development of disease and that others would destroy disease. Substances with higher frequency will destroy diseases of a lower frequency. 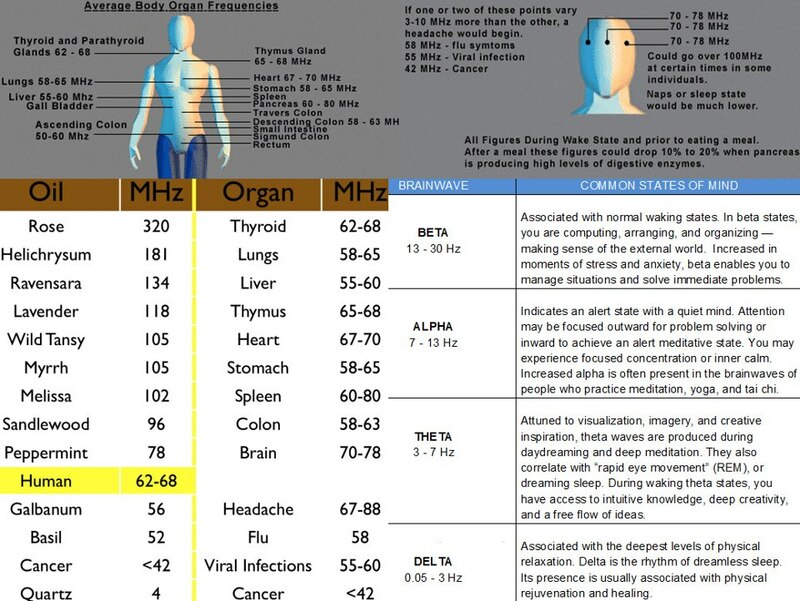 The study of frequencies raises an important question, concerning the frequencies of substances we eat, breathe and absorb. Many pollutants lower healthy frequency. Processed/canned food has a frequency of zero. Fresh produce has up to 15 Hz, dried herbs from 12 to 22 Hz and fresh herbs from 20 to 27 Hz. Essential oils start at 52 Hz and go as high as 320 Hz, which is the frequency of rose oil. Clinical research shows that therapeutic grade essential oils have the highest frequency of any natural substance known to man, creating an environment in which disease, bacteria, virus, fungus, etc., cannot live. American inventor Nikola Tesla (1856 – 1943), a pioneer of electrical technology, said that if you could eliminate certain outside frequencies that interfered in our bodies, we would have greater resistance toward disease. Every essential oil has a frequency and each of our organs and body parts have a frequency. The frequency of an oil will attract a like frequency in the body. Lower frequencies become a sponge for negative energy. The frequency is what stays in the body to maintain the longer lasting effects of the oil. Low frequencies make physical changes in the body. Middle frequencies make emotional changes in the body. High frequencies make spiritual changes in the body. Spiritual frequencies range from 92 to 360 Hz. (Bone frequency is 38-43; neck and down frequency is 62-68). Dr. Robert O. Becker M.D, in his book, The Body Electric, who also explains that a person's health can be determined by the frequency of the person's body. Another doctor and scientist, whose research has been buried for some time but has managed to resurface due to the work of avid supporters, is Dr Royal Raymond Rife M.D, who developed a frequency generator in the late 1920’s. In brief, Rife successfully treated 1,000 patients diagnosed with incurable cancer in the 1930’s. He was honoured with 14 awards and an honorary doctorate. After the unsuccessful attempt by pharmaceutical companies to buy out his research and equipment, his office was ransacked, his research paperwork was stolen and the machine that healed all those 1,000 “incurable” cancer patients was destroyed. 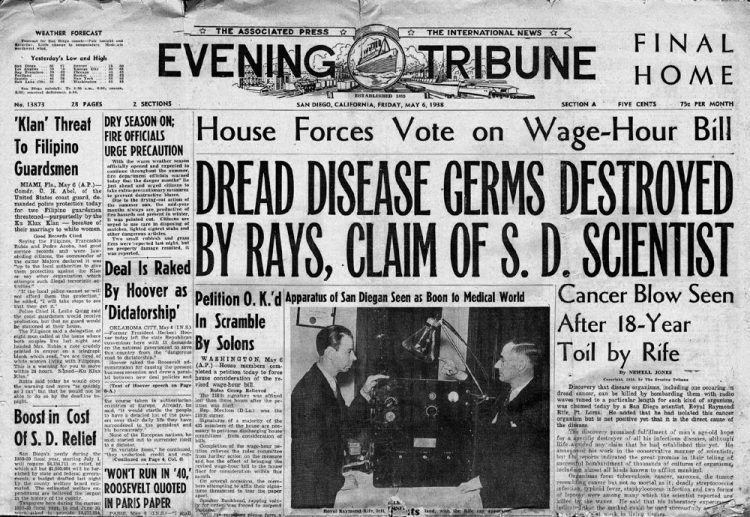 What Rife had developed was a 100% effective cure for many forms of cancer. So why do we not know about this and why are there so many cancer research foundations in existence? Put simply, it is due to the economic motives of the orthodox medical community, which relies on funding for cancer research - such funding often coming from pharmaceutical companies - and whose fortunes would be damaged if a cure for cancer was found. (That is, it’s OK to search for a cure but don’t really find one!) This is a story that illustrates yet another grand attempt by the mainstream medical community to control the lives - and deaths - of so many millions of people today. “In every culture and in every medical tradition before ours, healing was accomplished by moving energy." - Albert Szent-Gyorgyi, Nobel Laureate in Medicine (1937) What Rife proved is that every health disorder has a frequency, which in turn responds (resonates) to a specific (optimal) frequency for its dissolving/healing in the body. People who maintain their optimal frequency, at least of their immune system, would prevent development of symptoms and illnesses associated with the common cold. Of course, in practise this does not work for most of us because, being human, we experience stress and emotional challenges on a daily basis, which lower our body frequency. Hence, we need to raise our body frequency regularly/daily with the right substances that are compatible at the cellular/energic level of our being, rather than wait until our body frequency has dropped so low that it becomes a friendly host for microscopic invaders. How can we prove this? According to a report (Epidemiology, May 2001; 11:345-349) psychological stress - particularly the chronic type that may accompany a personality with a negative outlook - is a risk factor for contracting colds. An optimistic outlook and outgoing personality seemed to protect individuals, investigators found. The findings indicate that high levels of psychological stress are closely associated with contracting the common cold. While the common cold is rarely a serious health hazard, it is responsible for about 30 million days of lost work in the U.S. alone each year. To investigate whether stress increased the likelihood of developing a cold, the researchers surveyed more than 1,100 Spanish university staff and students at regular intervals over a one year period. The study focused on different types of stress, including stress from life events, perceived stress, having a generally negative outlook, anxious or compulsive personality, compared with having a positive outlook/attitude to life. Individuals with a negative outlook were at greatest risk of developing colds - regardless of their intake of vitamin C and zinc or their smoking and drinking habits. The next highest-risk individuals were those who believed that they were under stress. These people were nearly three times as likely to develop a cold, according to the report. Why Should I Avoid An Antibiotic? Colds can be contracted as the result of contact with more than 200 different viruses. However, among all of the cold viruses, the rhinovirus and the coronavirus cause the majority of colds. Each time you have a cold, it is caused by a distinct virus (e.g. adenovirus, rhinovirus, parainfluenza virus, and coronavirus). Viruses are much smaller than bacteria. They are tiny clusters of genetic material surrounded by a protein ‘wrapper’. Medical science currently does not have any drugs that can kill these viruses. Antibiotics, including penicillin, do not have any effect on viruses. They are only used to treat secondary bacterial infections that can further complicate the effects of a cold. How Do We Actually Contract the Cold? The most common source of infection is not from coughing or sneezing, or walking barefoot in the rain, but from hand-to-hand contact. That is why, when you have a cold, washing your hands frequently is very important. The likelihood of contracting the cold virus increases, however, if one is overtired and physically exhausted. Most uncomplicated colds last eight to nine days; about 25% last two weeks; and 5 -10% last three weeks.As long as one’s temperature remains below 38.8 degrees Celsius, there is no need to lower it. Cold viruses do not reproduce at higher body temperatures. In fact, a slight fever should help us get rid of the virus quicker and feel better much sooner. It is our body’s own way of ridding itself of toxins.Why are Aspirin and Tylenol counterproductive?A study (J Infect Dis, Dec 1990; 162(6):1277-82) showed that people who take aspirin and Tylenol (acetaminophen) suppress their body's ability to produce antibodies that destroy the cold virus. This actually causes the body to take longer to fight the cold and it accounts for any secondary infections and post-nasal drip. What Can We Do to Avoid Common Cold? While orthodox medicine does not have the answer for colds and ‘flu, nature does - and it comes in the form of pure organic unadulterated Therapeutic Essential Oils. Why? Because they are made up of very high frequency molecules (ranging from 52MHz to 320MHz) and contain nature’s wisdom and power to raise the body’s frequency and to assist our immune system to fight viral invasions. For greater clarity, organic Therapeutic Essential Oils are not the same as everyday aromatherapy oils, which are produced for fragrant and other purposes.